After a few days of sweet potatoes, we introduced one of my favorite foods- avocados! Avocados make a great first food for a number of health reasons, but my favorite reason is that they are SO EASY! I'm a little lazy when it comes to baby food. I'm not really a "making my own baby food" kinda mom. To be honest, it's just a little more pre-planning than I'm up to. Typically, I don't think about feeding the baby until it's time to feed the baby- so, as long as I have a ripe avocado on hand, I have instant baby food!! I was worried that he was getting a little constipated after several days of avocado, so I also wanted to introduce pears. There weren't any organic pears at Whole Foods and I no longer live close to my favorite "Healthy Food Store," so I bought a few jars of Earth's Best pears. Do you make your own baby food? What do you like/ not like about it? What are your favorite quick and easy "go to" foods for babies? Thanks for sharing your link Giselle. You have a lot of great recipes that I'd like to try. 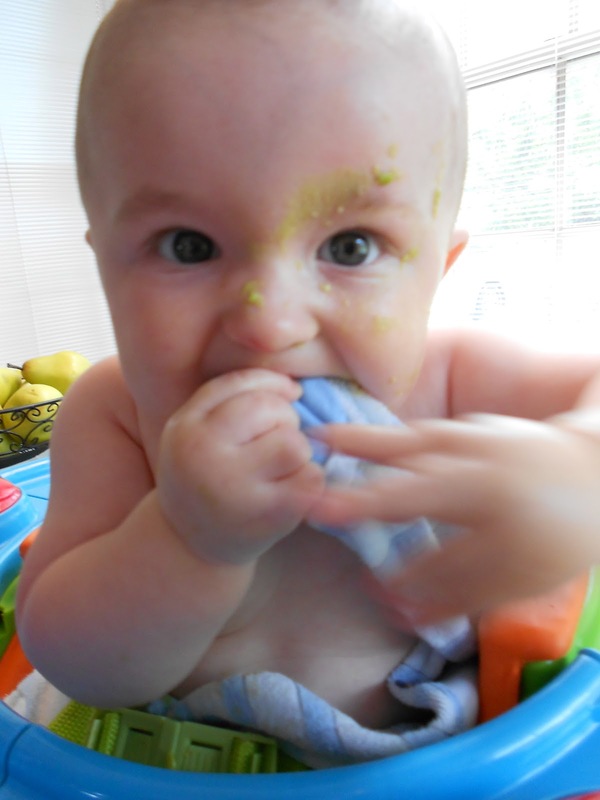 I'm pretty much not a fan of "baby food" in general and try to move on to finger food as soon as possible. Though I love the idea of making a bunch of baby food and having it ready to go in the freezer, this is child number 4 and I haven't done it yet :) Usually, I just end up adapting whatever we're eating for the baby which is certainly more difficult at this stage! Great ideas Abby! Yes, with multiple little ones there seems to be a quite a few things that just "don't happen anymore!" I so hope my future children are better eaters than I am - I'm 25 and still can't do avocadoes. I did make some progress recently and discovered I'm not as terrified of tomatoes as I thought I was though I still don't care much for them. I have always loved pears though! I remember being in elementary school and picking out the peaches and pears in the fruit salad concoction that they served at lunch because they were only things I liked!